Alumni weekend was full of victories for Texan and TexAnn basketball. Both teams, men’s (15-5) and women’s(13-5), defeated the Western New Mexico Mustangs, adding important conference wins to their record. “Finishing the first part of the conference with a win was good, now we can build off of that and hopefully keep it going in the right direction,” sophomore guard Nina Alvarez said. 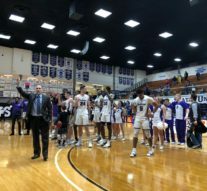 Tarleton men’s basketball earned its second straight Lone Star Conference win 69-59, improving to 5-4 overall, with senior forward Jesse Hill leading the team scoring 19 points and eight rebounds. Junior forward Josh Hawley is just 29 points away from scoring 1,000 career points. Though a low-scoring first half, women’s basketball defeated the Mustangs 66-52 in a very defensive game. The TexAnns finished the first round of the LSC with a 6-4 overall record. The Mustangs held just a .272 shooting mark from the floor due to the tough TexAnn defensive efforts. Senior guard Kaylee Allen led the scoring for the TexAnns with 17 points and senior guard McKinley Bostad contributed 16. Tarleton will be back in action on Thursday in San Angelo to kick off the second round of the LSC against Angelo State University. “We have to have the same mindset as we did going into the West Texas A&M game and we can for sure come out with the victory,” Alvarez concluded.